Craft is at the heart of all great art, and so is intentional expression. I want anyone who sees my creations to experience the same joy and excitement that I do when exploring life’s natural wonders. Expanding people’s capacity for experiencing wonder in the world is the heart of my creative process. 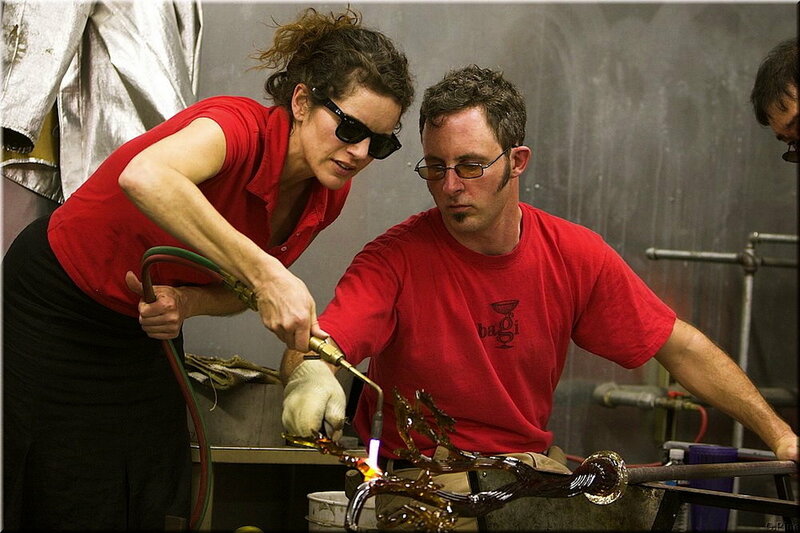 Artists Treg and Candace Silkwood partnered in 2002 to form Silkwood Glass and have collaborated ever since. Treg has spent over twenty -five years of his life mastering the skill and art of blowing and sculpting glass. Candace has spent nearly forty years exploring numerous art forms from painting to sculpture and has over fifteen years experience working glass. She is an innovative designer and a master technician in color and form. Together, the couple produces more, explores further and takes greater risks than each could alone. Glass blowing is an ancient art. Its roots are in the same sand and heat that birthed human civilization. Craft workers and artists have perfected and refined glass-working techniques many times over the millennia. Whole schools of art have grown and developed, and then been lost. Treg and Candace Silkwood are part of the latest resurgence of this foundational medium of human expression. They have studied traditional Venetian techniques as well as glassblowing in the heartland of American and around the world. They have taught and studied with glassblowers in Ireland, Austria and across the United States. Today, at the couple’s studio in San Jose, Treg and Candace bring new rigor and imagination to old and tested tools and techniques. The result is something extraordinary and fresh, yet timeless, and always meticulous and acutely detailed. The use of glass as a medium for sculpting is rare. It’s what Treg and Candace are known for. The exceptional quality and execution of their glasswork is why it has been exhibited internationally and won numerous awards including the 2010 People’s Choice Award and the 2009 Juror’s Choice Award at the Bay Area Glass Institute’s Annual Auction. Works by Silkwood Glass have been featured in Sunset Magazine and are available at prestigious galleries including Vetri International Gallery in Seattle and the Corning Museum of Glass in Corning, New York. In 2008, Steuben, which is America’s most prestigious crystal manufacturer, invited Treg Silkwood to hold a solo show at the company’s flagship store on Madison Avenue in New York City. Treg is only the second artist in a century to be afforded this honor. The Steuben Selection Series showcased more than 100 pieces of his sculptural work and cemented his reputation as one of the world’s foremost glass artists. Treg Silkwood - Treg Silkwood was born and raised in the valley of the Yellowstone River in Montana. A creative, outdoorsy, smart and athletic kid, he wanted to do a bit of everything, and he loved working with his hands. In college, he first studied biology, chemistry, anatomy and the rest of the course load required for medical school. He switched gears, though, and transferred to Alfred University in upstate New York to study art. Alfred University, for Treg, was a revelation. It exposed him to artistic disciplines, techniques and media that he hadn’t even known existed. He concentrated mainly on mixed-media sculptures and cast glass. In 1995, he spent a semester studying at the Academy of Applied Arts in Prague. In the Atelier of Glass, he learned cold-working techniques and how to make Czech mold-melted glass. In 1996, Treg graduated from Alfred as the top student of the Art and Design School. For five years after college, Treg worked producing recreations of Early American Glassware at Greenfield Village in Dearborn, Michigan. Greenfield Village is a living and breathing museum of American history and is a part of the Henry Ford Museum. At The Village, Treg refined his glass making technique through endless repetition, critique and revision. His tenure there both refined his craftsmanship and taught him a deep appreciation for the history of glass. It was here that Treg developed his exceptional skill as a gaffer and discovered the value of using blown glass as a vehicle of expression. Later, after Treg pursued graduate studies with Jack Wax at Illinois State University, he was honored to become one of the first gaffers for the Hot Glass Road Show of the Corning Museum of Glass. He continues to work closely with the Studio of the Corning Museum of Glass. In 2002, Treg relocated to the San Francisco Bay Area, where he and Candace Martin formed Silkwood Glass—a custom, handcrafted glass company. As much as an artist, Treg is also a teacher. He thoroughly enjoys sharing his love and knowledge of glass. He has demonstrated and taught glassblowing across the United States and abroad including at Pilchuck Glass School, the Studio of the Corning Museum of Glass, Waterford, Ireland, and Niijima, Japan. He has been a teaching assistant for numerous glass maestros including Elio Quarisa, William Gudenrath, Randy Walker, and Karen Willenbrink-Johnsen. For three years, Treg was a resident artist and teaching assistant at San Jose State University, where he worked closely with Mary White. Since 2002, Treg has worked as an independent glass artist and instructor in the Bay Area. He holds the positions of Artistic Director and Senior Glass Instructor at the Bay Area Glass Institute, where he is also an active member of the board. Candace Silkwood - Candace Ann Martin Silkwood was born in Saratoga, California. She was raised between there and a family cattle ranch in Oregon. Her interest in art began in early childhood. She has painted and sculpted for as long as she can remember. Candace's career as an artist began at age 13, when she sold her first piece. Since then, she has had numerous commissions and has exhibited her work in Los Angeles and throughout the Bay Area. Artistically, Candace has explored a wide variety of media and materials. Painting has been her primary outlet, though she has explored both sculptural work and installation art. Her love of color drew her to glass. Her fascination with glass found an outlet fifteen years ago when she began assisting Tom Stanton, a local glass artist in the Santa Cruz Mountains. Working production introduced her to the idea of making art as a team. She also found that she had an apt patience for cold working. In 2002, Candace met Treg Silkwood. The two immediately fell in love and soon after combined their talents to form Silkwood Glass, a custom, hand-crafted glass company. Treg and Candace bring complimentary talents to their partnership, Candace's painterly sense of color and good eye for design are coupled by Treg's glassblowing expertise and mastery of form. As each piece is formed from the molten glass, the couple shares a dynamic relationship. Throughout the creative process, their interaction seems choreographed in a whirl of constant motion and ongoing discussions about color application, proportions and design features.